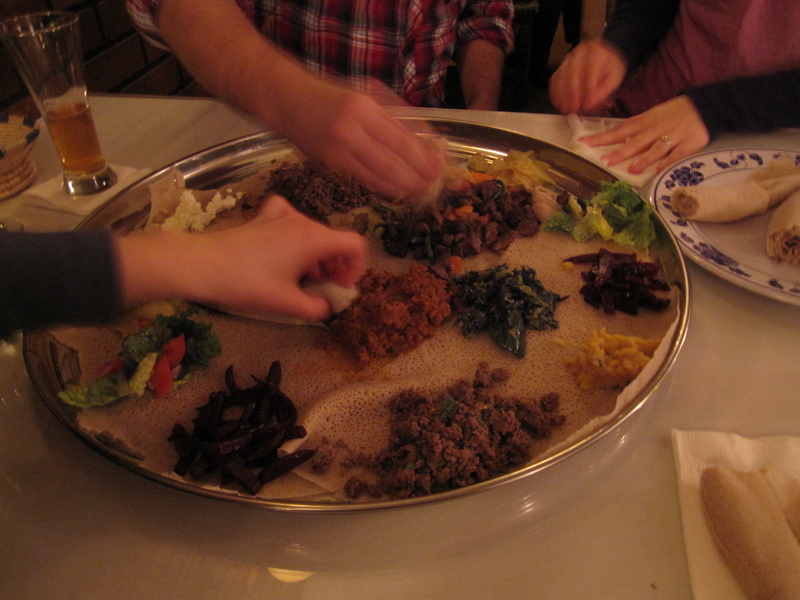 Last Friday night we checked out another Ethiopian joint with a couple of friends. This time we went to Abyssinia, which funny enough, is literally next door to Ras Dashen. While they both serve typical Ethiopian dishes they could not be more different in atmosphere. Ras Dashen has live music on Friday nights. You can hear live music in Abyssinia, but it isn’t being played there. It’s the music from Ras Dashen! 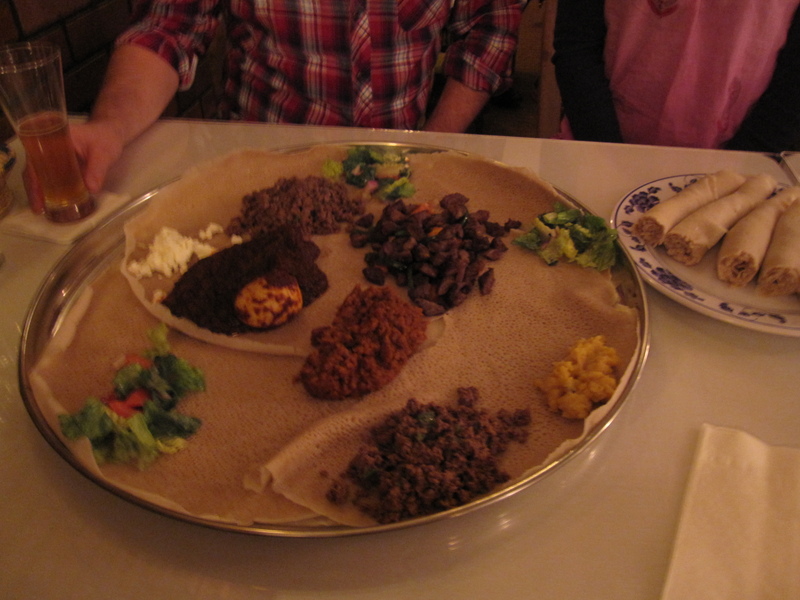 Abyssinia is a very cozy ma and pa type of restaurant while Ras Dashen is a little more lively and urban hip. I can’t really say which atmosphere I prefer because they both have their charms. On to the food. 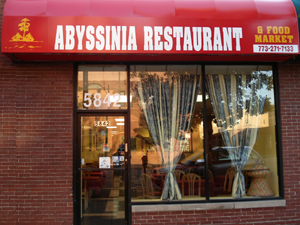 The main difference is that Abyssinia doesn’t offer appetizers, salads, or soups. They basically just serve breakfast and lunch/dinner entrees. That was a little disappointing because I wanted to compare Sambusas with Ras Dashen. Oh well, what can you do? True to Ethiopian style everything was served family style on top of Injera. We ordered the Doro Wat, Miser Wat, Derek Yebeg, and a ground beef special that’s on their physical menu but not their digital menu from their website. They actually gave us two portions of the ground beef. The sides were some yellow lentils and a few little salads. Extra Injera on the side of course. The food took about 20 minutes or so to come out. That was fine with us as everything was being freshly prepared. Not to mention the delicious Ethiopian beer we were drinking, that tided us over for a bit. Abraham, the owner, came out and gave us some collard greens, goat cheese (tasted much like feta), and some warm beets because of the wait. Super nice guy, he has a true heart of hospitality. If my grandma was an Ethiopian man she’d be him. Anyway, the food was awesome! Everything was friggin fantastic. The Miser Wat may very well be the best pile of lentils I’ve ever passed through my tracts. I think I liked the Doro Wat a little better at Ras Dashen, but everything else was better here. Not by much mind you, as I’d go back to either place over and over again. The only real criticism I can give about Abyssinia’s food is that the lamb chunks in our Derek Yebeg were a little dry and not real tender. I think they just cut the pieces a little too small. It did have a wonderful flavor though. There were also plenty of leftovers as Ethiopian food is much more filling than it looks. We split the leftovers with our friends and had plenty for lunch the next day. I’m sure it was the same for them. So we basically got two meals each at extremely reasonable prices. 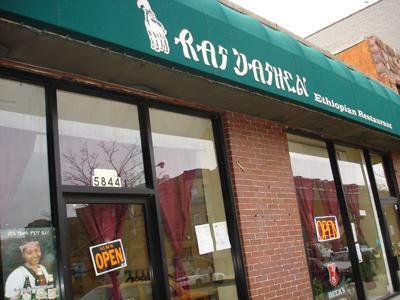 It’s hard to say which is the best Ethiopian in Chicago. If you want live music head to Ras Dashen. If you only want to hear the bass from the live music head to Abyssinia. Otherwise you can’t go wrong with either. 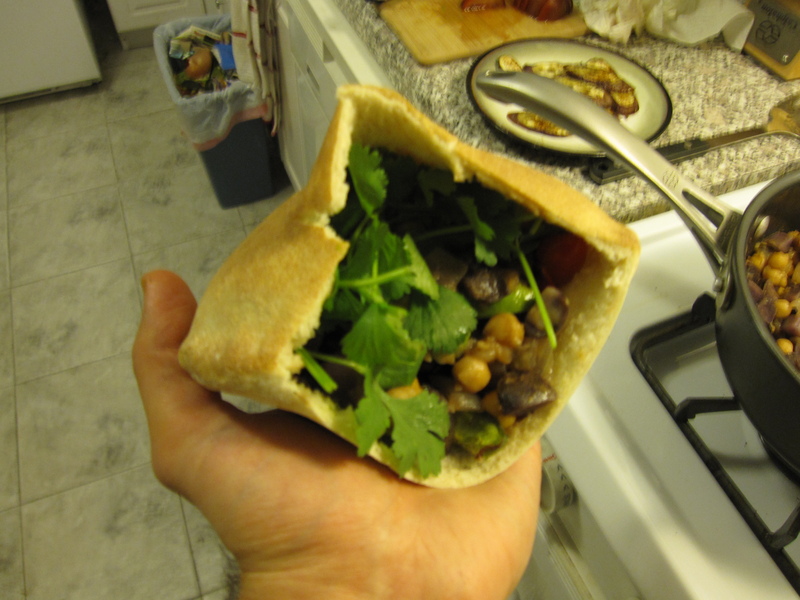 We picked up some pita bread yesterday so we decided to make some vegetarian pita sandwiches for Meatless Monday. The beauty of something like this is that you can fill them with absolutely anything! We went with a more Middle Eastern flavor. I sliced a Japanese Eggplant into quarter inch thick slices. I also sliced one large red pepper and one large green pepper into quarter inch slices. On a baking sheet I drizzled some olive oil and laid them all on. Then I drizzled some more olive oil on top of the veggies and sprinkled them with salt, pepper, paprika, and cumin. I roasted them in the oven at 400 degrees for about 10 minutes. Then I took the eggplant off the sheet and put the peppers back in for another 5 minutes. While those were roasting I sautéed some diced purple potatoes in olive oil for about 10 minutes to color the surface. Then I added some chopped onion and garlic and sautéed for another 7 minutes. After that, I added a half cup of chicken stock. Scraping up the browned bits on the bottom of the pan I mixed in some salt, pepper, paprika, and cumin. Then I added a drained can of chickpeas and let it simmer until the liquid was almost completely evaporated. After turning off the heat I added the juice from one lime. I put a couple of pitas into the oven while it was still hot for a couple of minutes to warm them up. After slicing the top off I filled them with all the goodies plus some tomatoes and avocados I sliced. Then I shoved some cilantro into whatever little crevice wasn’t filled yet. Another Meatless Monday in the books. 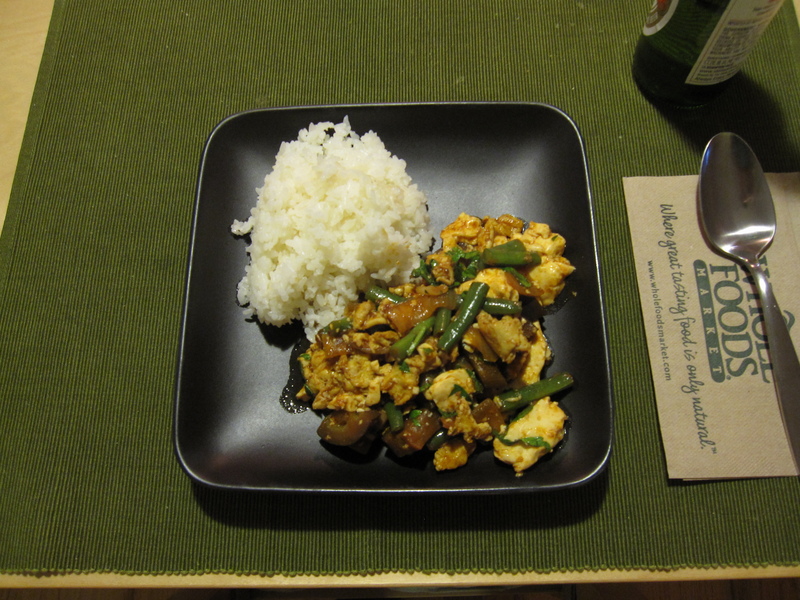 I had some veggies and tofu I needed to use up so I made a vegetarian version of Mapo Tofu. I chopped up half of an onion and sautéed it for a few minutes. Then I added a half-inch piece of ginger and two cloves of garlic, both grated. After a few minutes I threw in some green beans that I cut down to smaller pieces. A few more minutes and I added some diced baby eggplant and some chopped mushrooms. While that was all sautéing, in a hot skillet I poured in a couple tablespoons of vegetable oil and scrambled two eggs. The hot oil cooks the eggs up nice and fluffy. Once they were almost finished I put them on a plate off to the side. Back to my veggies. I seasoned with salt and a lot of freshly ground Sichuan Peppercorns, that’s what will give it the numbing burn you need with a good Mapo Tofu. Then I added about three tablespoons of water just to deglaze some of the garlic and ginger bits on the bottom of the pan. After that I added three or four tablespoons of soy sauce and a spoonful of Korean Chili Paste, any kind of chili paste will work for the most part. Once the sauce was nicely mixed I added the scrambled egg making sure it was broken into smaller pieces. Finally, I added a block of diced silken tofu that I had drained the water from. To drain the water I lined a plate with a couple of paper towels, laid the tofu on top, then a couple more paper towels, a cutting board, and then something to weigh it down a little. That sat in the fridge for about 45 minutes. When the tofu was coated with the sauce and heated through the dish was ready, about 5 more minutes. I simply served it with plain white rice and a cold beer. Oh, right before I served it I threw in some chopped parsley. I did this only because I had some in the fridge and thought it would add a nice freshness to all the spice. It did. I had to start with some Ethiopian coffee, the mother of all beans. They serve fair-trade organic, nice and smooth cup. For an appetizer Yuki and I ordered some Spinach Sambusas. 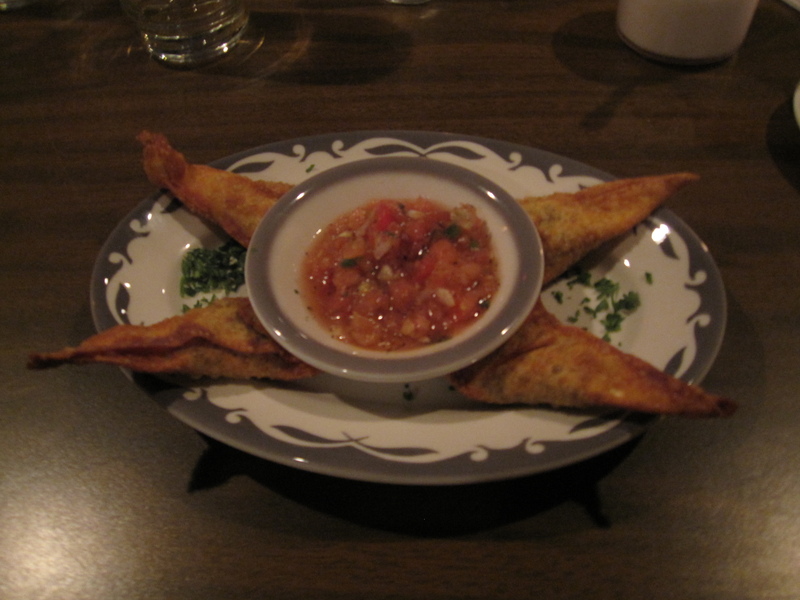 Lightly fried pastries filled with spinach and dipped into a spiced salsa. Very tasty, not too heavy. Think of them as Ethiopian empanadas or samosas. Since our friends ordered the Doro Wat (chicken and egg in berbere, Ethiopia’s national dish) we had to get something different. Although, it wasn’t that different at all. We got Yebeg Wat (lamb in berbere) and Doro Alicha (chicken and egg in onions, garlic, ginger, and green peppers). 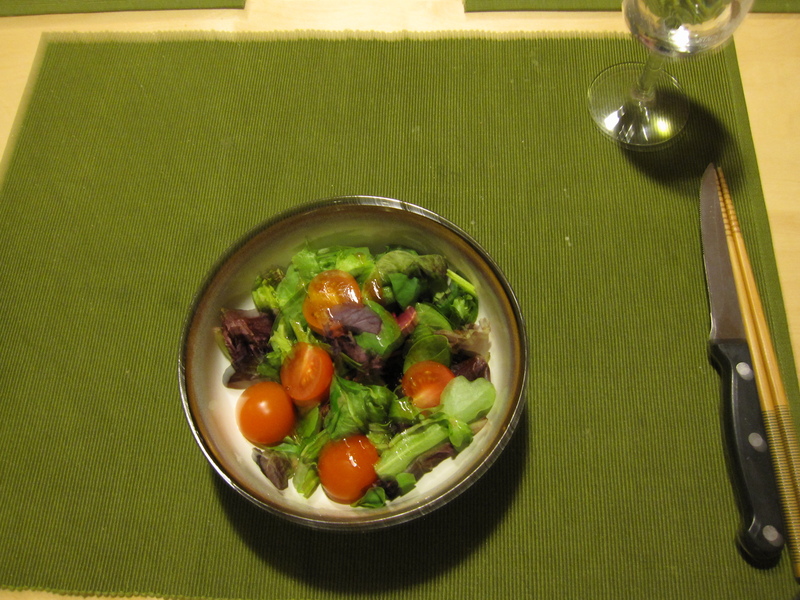 We ordered the Diblik Atkilt and Misser Wat for our sides, our friends got the Misser Salata, I think. You can check out their website for descriptions of the sides. All served on top of Injera with extra on the side. Those of you not familiar with Ethiopian cuisine, you don’t eat with utensils. The food gets dumped right on the Injera allowing the bread to soak up the sauces and juices. You rip off pieces of the Injera, using it to grab you rip pieces of meat off the bones or piles of lentils, and chow down. 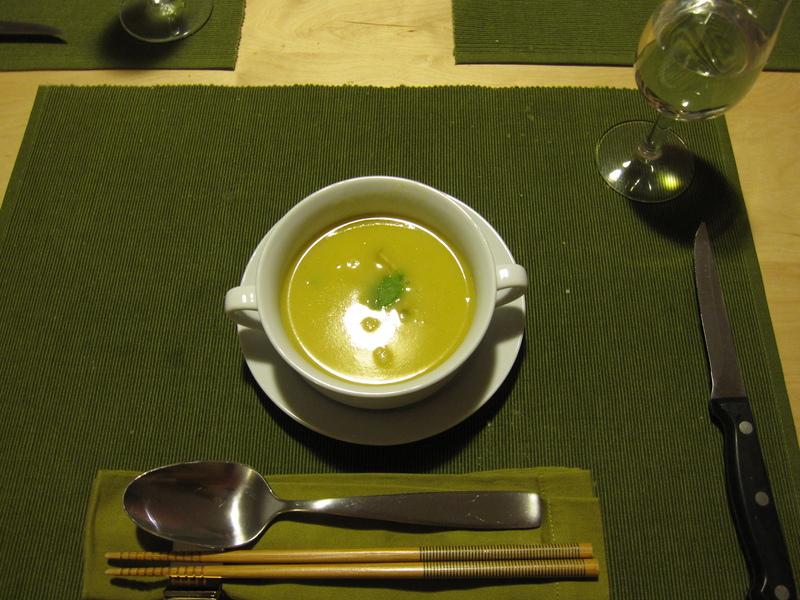 It’s absolutely delicious as well as being a fun, communal way to eat. Berbere is Ethiopia’s most famous sauce. It’s a red pepper sauce with spices like ginger, coriander, cardamom, cinnamon, nutmeg, fenugreek seeds, paprika, onion, and garlic. It’s actually very similar to Indian spices, but it’s definately distinct. 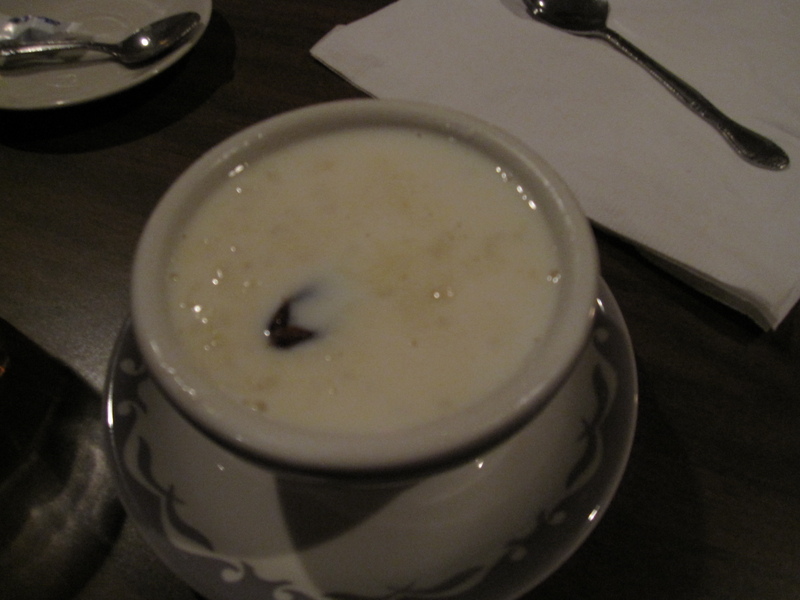 Back to the meal itself, we ordered the rice pudding for dessert. It was quite nice, very mild. There was a date in the middle. 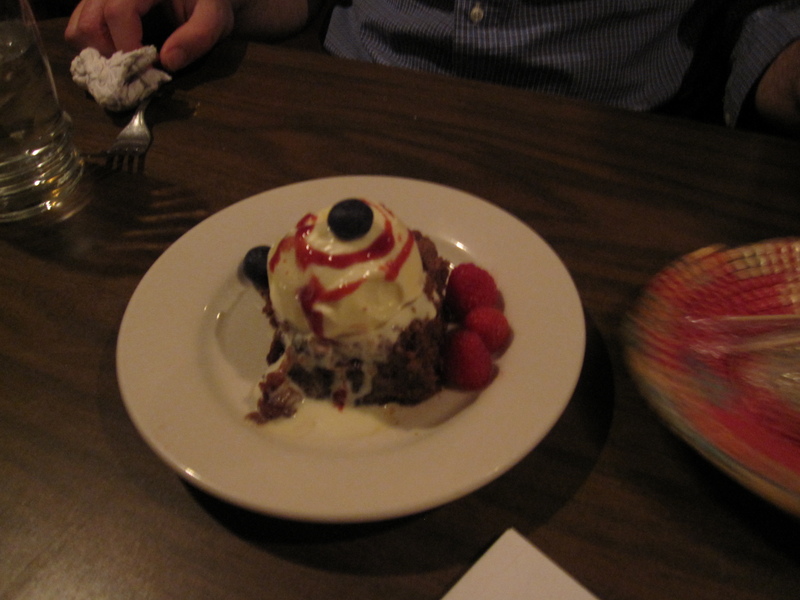 Our friends got Ras Dashen’s famous bread pudding. It’s made with varius nuts, raisins, and tons of flax seeds. It was definitely a winner in my book. Half-way through our meal a little jazz quartet started to play. They were pretty good. Saxaphone, guitar, bass, and bongos. It wasn’t too loud so conversation was never difficult. I guess the one disclaimer I have is what I was warned about. 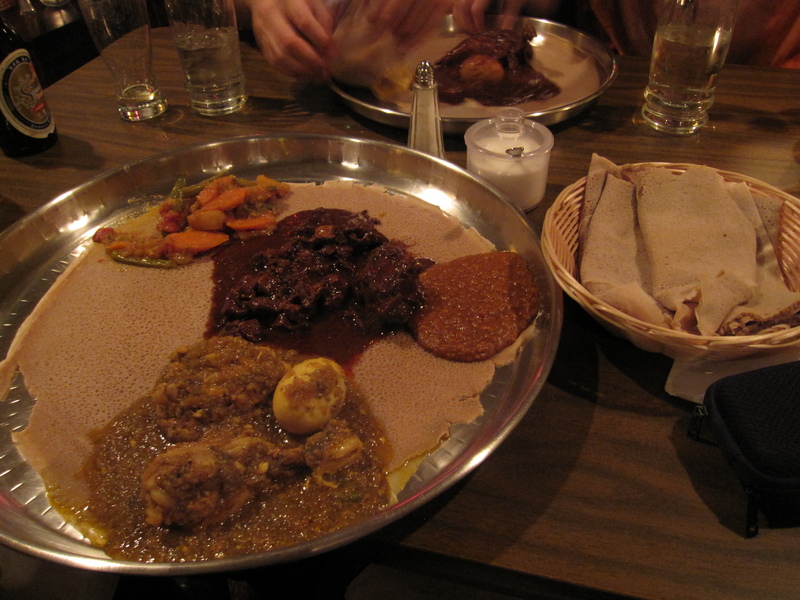 Once you have Ethiopian food, no matter how strong-willed you are, you will start to crave it. It was extremely reasonably priced as well for the quality and amount of food served. I have to check out a few other places before I decide just how good Ras Dashen really is, but I will say this, I would definitely go back! Alright, another Meatless Monday in the books. 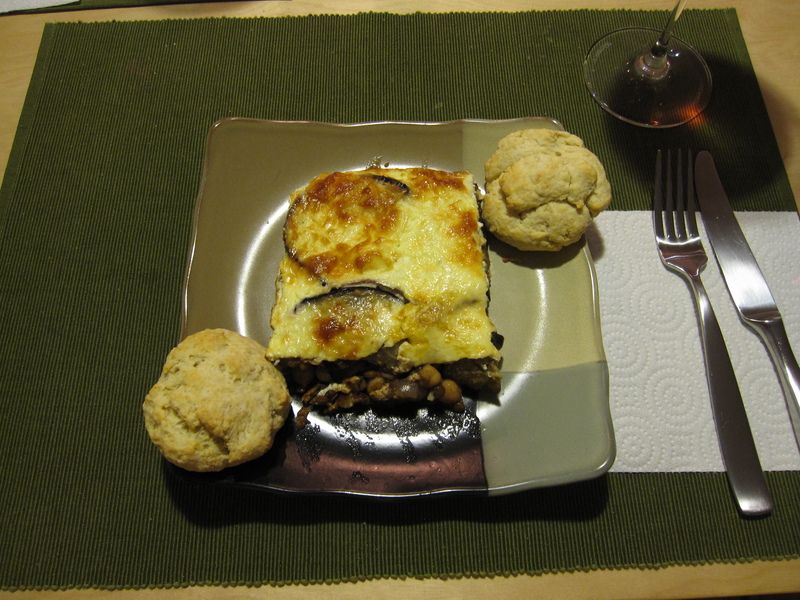 Yesterday I made Moussaka for dinner. 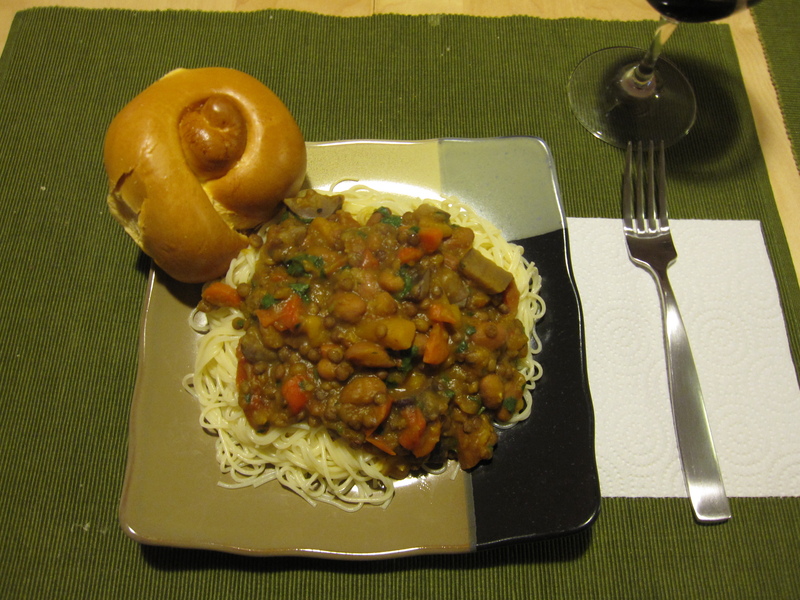 Traditionally made with lamb, I omitted the meat and made my own version. 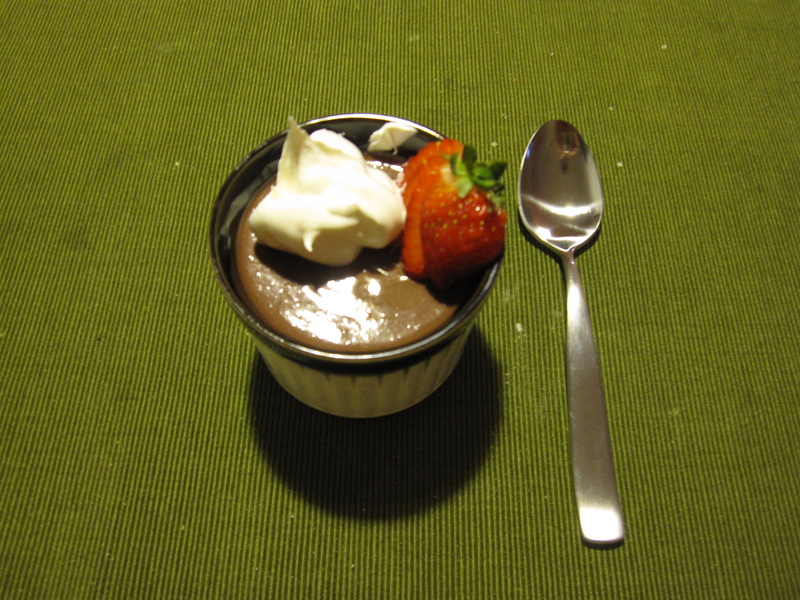 It was a lengthy process, but the results were delicious! I sliced an eggplant into about 1/8th inch slices. Then I layered them on a colander and sprinkled some salt all over them. I put a heavy bowl on top and added some weight and let the bitter juices drip out for about a half hour. While that was going on I simmered about a half cup of green lentils in vegetable stock with a bay leaf for 20 minutes, just before they became tender. I prepped my other veggies while all of that was going on. One onion sliced, two large portabella caps sliced, two cloves of garlic smashed, two medium potatoes sliced to 1/8th inch, I opened up a 14oz can of chopped tomatoes, and one can of chickpeas. I rinsed and dried the eggplant slices and drained the lentils. I heated a pot to medium-high and sautéed the onion and garlic in olive oil. 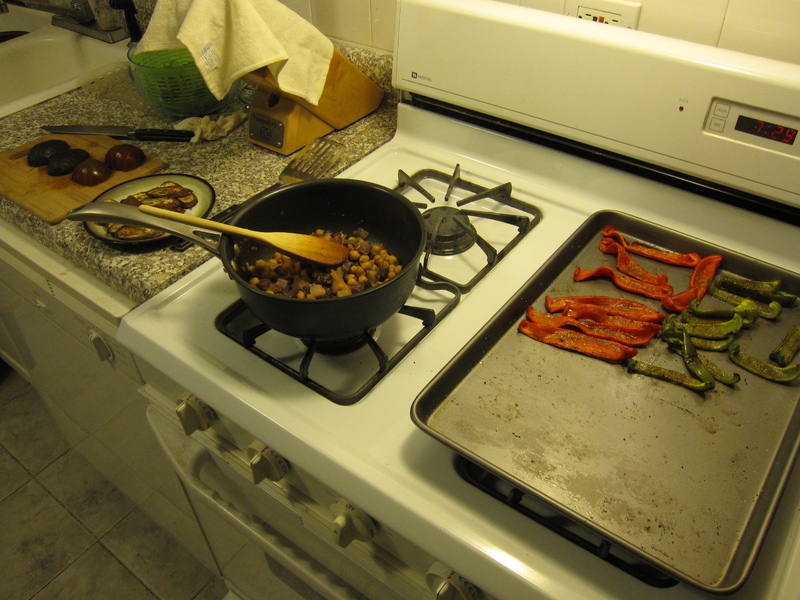 During that time I also heated up a large skillet to medium-high. In the skillet I added a little olive oil to coat the surface and added the sliced eggplant in batches until they were all browned, about 3 minutes on each side. Then I did the same with the potato slices adding a little oil as necessary. Once the onions in the pot were soft, about 6 minutes or so, I added the mushrooms for a couple of minutes until they started to give off some of their moisture. Then I added the chopped tomatoes with a couple tablespoons of tomato paste and stirred that in. After that I added the chickpeas and lentils along with a few tablespoons of water and some rosemary and thyme, salt and pepper. I let that simmer for about 10 minutes. In a baking dish I layered the potato slices to cover the bottom. I removed the herbs from the stew and poured that on top. 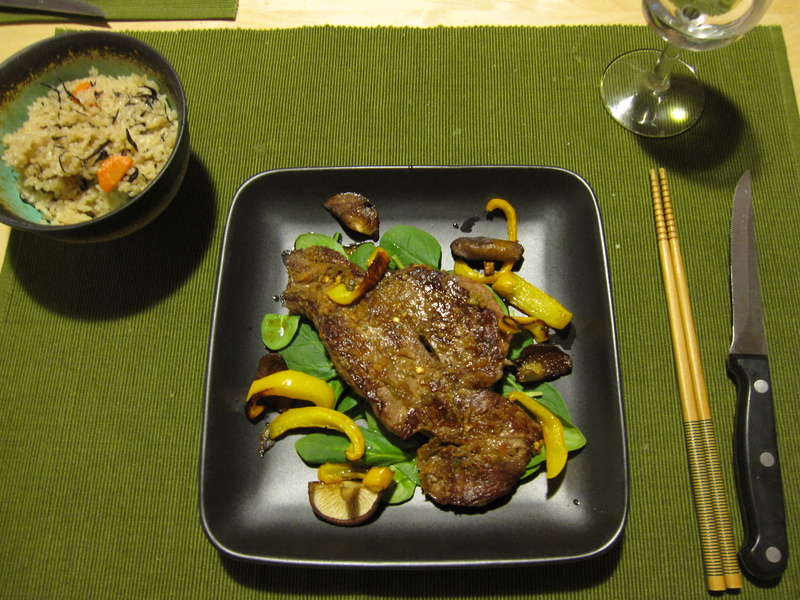 Then I layered the eggplant slices on top. Then I beat three eggs with a cup and a quarter of greek yogurt, salt, and pepper. I poured that on top. Finally, I grated a half cup of mozzarella and sprinkled that all over. I threw it in the oven at 350 and baked it for 45 minutes until the top was starting to brown. I had some buttermilk in my fridge that needed to be used up so I made some biscuits to serve alongside.